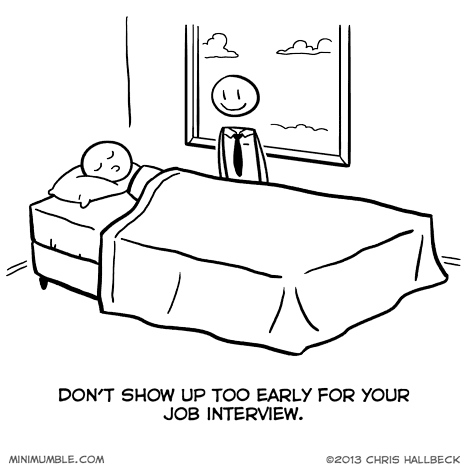 For job interviews, being early is better than fashionably late. Don’t be too early though. Try and stick to the same week at least. I prepared myself for the interview by studying a list of the top ten most common interview questions and forming appropriate answers. Too bad “Who are you what are you doing in my house get out I’m calling the police” wasn’t on the list. None of the officer’s questions were either. Guess it’s just one of those days. At least, don’t smile like that! Reminds me of Alice Cooper. According to Alice’s memoir, the Alice Cooper Show actually did this. Frank Zappa told them to show up at his house at seven; he meant pm, but they heard am. A bleary-eyed Zappa comes stumbling downstairs, wondering who’s setting up in his living room. WTH, they’re already set up, let ’em play. And then Zappa, King of the Freaks, signs them, ’cause they’re so weird even HE doesn’t know what they’re doing.